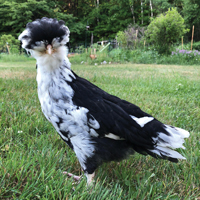 Polish are one of the most beautiful of all poultry breeds with their large, distinctive crests. They are of very ancient origin for in many pictures by the old masters, and especially those by Dutch and Flemish painters, the fowls shown in rural scenes are unquestionably Polish. They are quiet and gentle birds, owing perhaps to their restriced vision because of the crests. These were raised extensively on the many small farms near the village of Houdan in France; and this locale and the lovely black plumage in which many feathers are tipped with V-shaped white spots give them their name. The Sultan chicken is an extremely rare breed. 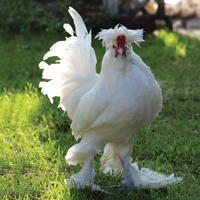 These majestic, all-white birds have a top crest, muff, beard, feathered shanks, and a fifth toe. 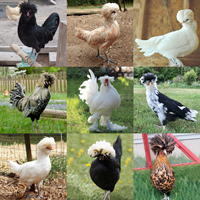 The crested breeds are the most interesting and beautiful of all chickens with their full, feathery crests. The baby chicks are especially pretty and cute as the crests show up as little top hats right from the start. These breeds are very quiet and gentle and don't seem to stray too far from their yard.